In the early days of education in Moneymore the Catholic children were sent to a school out in Coltrim and probably had to walk. 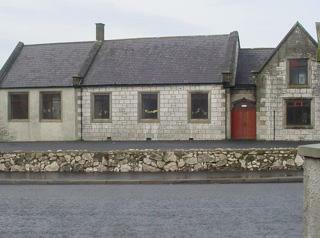 Later, a building, known as the Old School came up for sale. It was owned by the Draper’s Company and was used as a hall where bands would practise. The asking price was £300, a lot of money in those days! The Bishop of that time promised that for every £1 raised by the parish he would subscribe £2. £100.00 was duly collected and the building was bought. So the parish had a school of it’s own in the town where people of every walk of life received their early education. Until reorganisation, the pupils stayed at this school until they were 14 years of age and then left for work. The school remained opened until 1973 and since then the children have attended the New School…….St Patrick’s. The school crest, has elements of special significance and relevance to Moneymore. The symbol of the shamrock and the central cross relate to St Patrick, that of the oak leaf and acorn reminds us of Derry, while the shrubbery is associated with the Irish word ‘Muine’, from which Moneymore got its name. The Bible reveals St Trea holding the book in her hand and the Cross of St John honours the other patron Saint of the Parish.